Separate 120 and 240 volt power cords disconnect from the rear panel of the machine without the use of any tools to allow your to common 120 and 240 volt power receptacles. Weighing in at 13 lbs. and featuring a convenient handle/shoulder strap, this little inverter-based TIG/Stick machine can be taken from location to location. 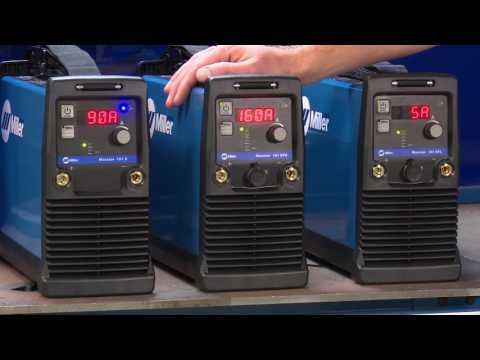 By utilizing an inverter-based power source in the Maxstar® 161, superior arc starts and excellent weld puddle control are provided in both the TIG and Stick settings - all in a small, light-weight package. Select process: Lift-Arc TIG, Stick, or 6010 Stick. Then weld! It’s as easy as 1, 2, 3. With Miller's Adaptive Hot Start™ technology, you no longer have to worry about those difficult-to-strike electrodes. With the Stick-Stuck feature the machine detects if the electrode is stuck to the part and turns the welding output off to safely and easily remove the electrode. Steel: 0.020 in. - 3/16 in.